The Warwick War Memorial in Church Street. 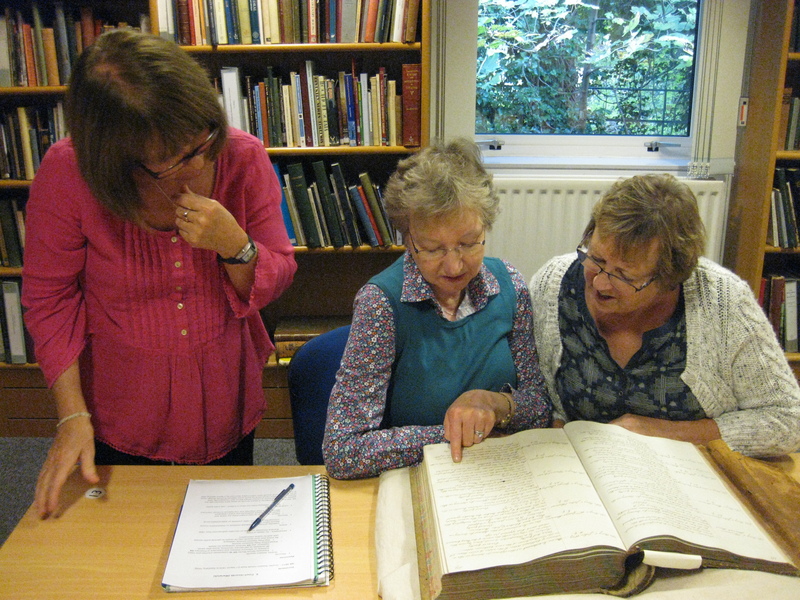 Researching the names in Warwickshire County Record Office. 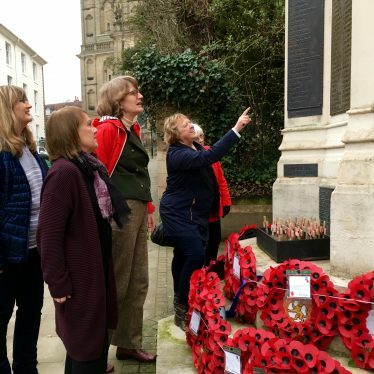 There are 358 names on the Warwick War Memorial in Church Street of the men, and one woman, who lived in the county town and died in the First World War. But what were their personal stories? Where did they live in Warwick? Which schools did they go to? What were their professions? What happened to them after they left for the war? 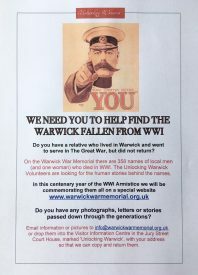 To mark the centenary of the WWI Armistice, Unlocking Warwick (the Town Council’s volunteers) have launched a special website that is full of information about the Warwick Fallen, and about what happened in the town during the Great War. All the names on the memorial can be searched in an alphabetical list under the section called ‘The Fallen’. 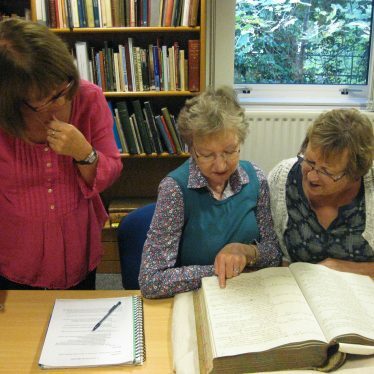 The volunteers have been working hard at Warwickshire County Record Office finding the ‘Shrine Slips’ that families had to submit of they wanted their relatives commemorated on the memorial, and looking at contemporary reports and death notices in the Warwick Advertiser. The project leader, Christine Shaw, became fascinated by the human stories behind the names when she discovered that one of her own relatives’ name was missing, and then she found records of several more Warwick men who had died in the conflict but were not commemorated, perhaps because no one had sent in Shrine Slips for them before the unveiling of the memorial in 1921. The Town Council agreed to add extra bronze plaques with the missing names. 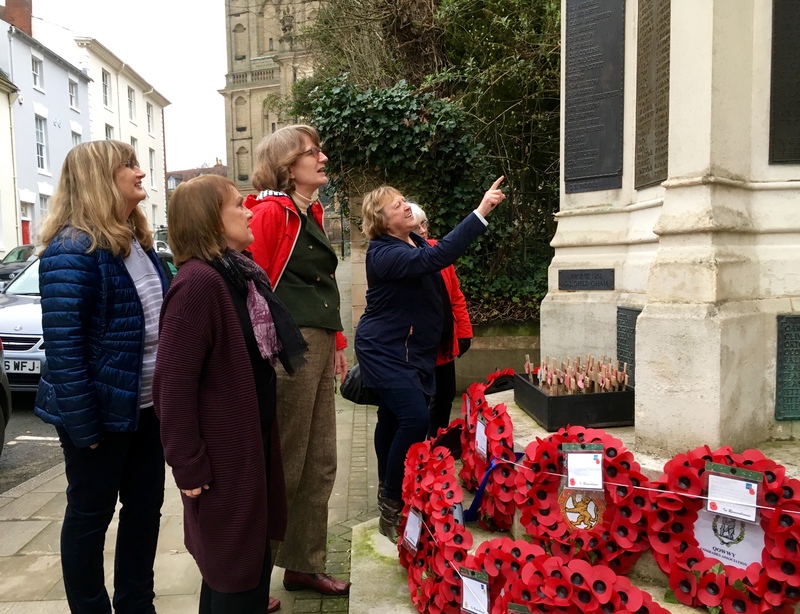 The local military museums, churches, schools, the Warwick Poppies 2018 project, and remembrance organisations such as the Royal British Legion Warwick Branch, have been providing valuable information. Now Unlocking Warwick is appealing to local people for their own photographs, letters or memories of family members or neighbours to add to the growing database. The project will continue after the centenary year as new information comes to light, and will serve as a permanent resource for schools, university projects, social historians and local people to understand better the sacrifices made in Word War One by a relatively small county town. The creation of the Warwick War Memorial website was made possible by a community grant from Warwick Town Council. Rick Thompson, Secretary Unlocking Warwick.